One of the reasons why a piece of art stands above the rest, apart from inner inspiration and inherent gift, is the technique that the artist uses. Successful artists have talents that not all of us possess. When an artist knows how to hone his talents to make it more valuable than the others, then he’s hit the pot of gold. One such artist is the glass sculptor Jack Storms. In the field of glass artwork, Storms isn’t the first to popularize it, but his contributions to this art are enormous. As early as the Middle Ages, glass was used as decorative windows for cathedrals. But Jack approaches this artistic technique in a divine way. He opens our awareness to how a piece of glass can capture and exude beauty beyond our imagination. 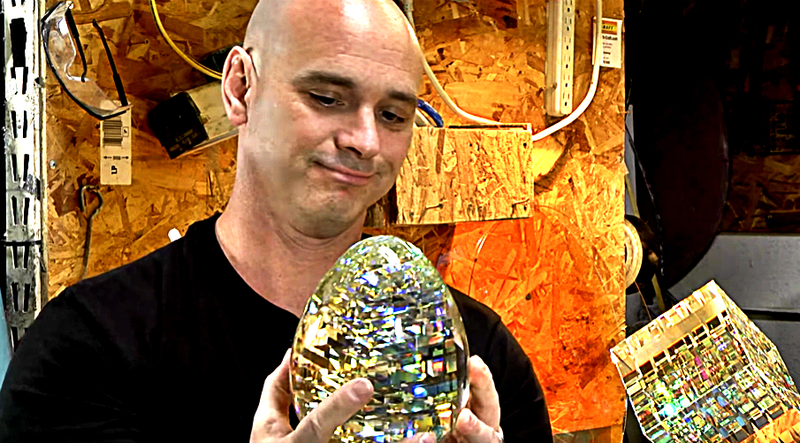 What makes Jack Storms’ art different from other glass art geniuses is his method of glass sculpting. According to Jack, he doesn’t use the traditional use of heat in glass artwork. 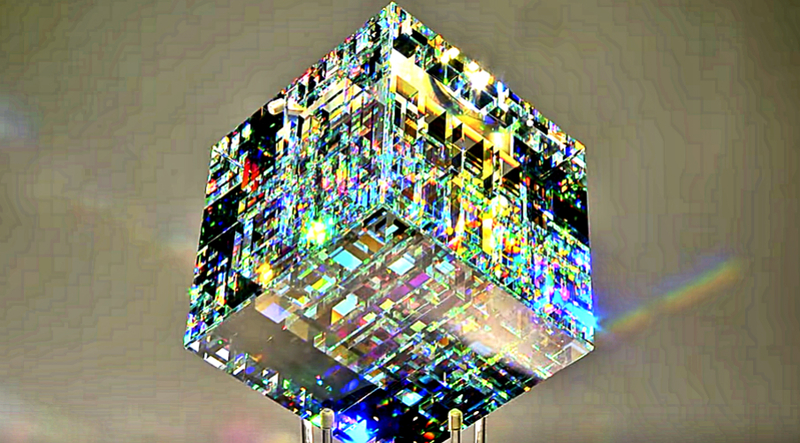 Instead, he has a rare style of combining lead crystal and dichroic glass using a cold glass process. He keeps grinding and polishing the glass until it fits his desired shape. This process may take more time, but for Jack, it doesn’t matter as long as the effects are brilliant. One piece of art may take 8 to 18 weeks to complete from start to finish and may involve lots of labor, perfection, and tolerances being so tight. But because Jack is in the pursuit of perfection, the process of polishing, administering the color, putting them all together, regrinding, and recutting is all worth it. Another thing that makes Jack Storms’ glass art phenomenally different is his use of the Fibonacci ratio and Fibonacci sequence. The Fibonacci sequence is found all around us, from our spiral galaxy to the sunflower seed heads, from the pine cones, to ancient architecture, and many others. The Fibonacci sequence and is ultimately what connects us to Nature and what connects Nature to The Universe. Because Jack’s art uses straight lines which are not present in Nature, he incorporates the Fibonacci sequence to make his art more natural, instead of mechanical or automated. For Storms, the Fibonacci is the bridge between the collector and the artwork. However, Jack Storms is not the first artist who uses the Fibonacci sequence. In fact, the art world considers Fibonacci sequence an important tool in art and which is also employed by other brilliant artists like Leonardo de Vinci, Michaelangelo, and Raphael. For Jack Storms, this is what inspired him to translate something from the ether, what’s in his thoughts, into something solid, something that he can see. 1. If you are passionate about something, take it seriously. Jack shares us a valuable lesson that if someone wants their art to be the way they want it, then they should take the time perfecting it, without shortcuts. He shares that he was scared to pursue his art career, but he realized that if an artist takes their work seriously than they will be successful. 2. Create your beauty within first, before you work on it outside. Another valuable lesson that Jack teaches us is doing what it takes to perfect the colors and polishings inside the glass art. Jack spends a lot of time perfecting the inner structure that will reflect the light. This is the essence of the beauty for each piece, the inner structure that reflects the light. In real life, this concept parallels the wisdom of perfecting what’s inside ourselves first, before we try to perfect what’s outside. Discovering our own structure of light. The beauty within that reflects color and light is what attracts people the most. That’s a lesson that applies to ourselves too, our inner beauty is what attracts other people if we let it shine through. If we work on ourselves first, we will shine a beautiful light. 3. Do something for the sheer beauty of doing it. What his art pieces means for him is determined by how it affects the person who is bringing it home. In short, the value of his art depends on how the person finds value in it. Jack Storms proudly says he creates something out of the sheer beauty of it. May we all get inspiration from this, creating something for the sheer beauty of it.